I thought I would share what I carried in my panniers while we rode through Denmark in case anyone out there needed help in deciding what to take on such a trip. I will divide my discussion into three parts – riding gear, street clothes and other stuff. Here I go. The only riding item I did not wear on this trip were the tights. It was not cold enough to wear them. The rain pants, jacket, long fingered gloves and buff were worn once and I was thankful to have them. Luckily we only got poured on the once, but we could have seen much more rain. When we cycle toured Prince Edward Island years ago, we got caught in the rain in our only set of street clothes, so on this trip I insisted we take two sets of street clothes. I used everything except the toque. If we had not been attending the music festival, I may have reduced the heavy clothing such as the socks and down jacket, but I needed the warmth for the evenings and cold weather, and they did get worn. I used my riding rain jacket as my street rain jacket. All the liquids were in small bottles and Murray also carried a bag of liquids. He also had the “first aid kit”. Some items I did not use and they worked their way to the bottom of a pannier and other items were used everyday. We stayed in hostels 4 nights so used the sleep sack only 4 times and I used the pillow every night. Next time I might leave that at home and only stay in B&Bs as they were much nicer and cost the same. We tried to keep the weight in my panniers between 20 and 25 pounds. The weight was distributed between the 4 panniers with the front having about 4 pounds each and the back each had about 8 pounds. The one thing we did that saved time when we got to Copenhagen was to make a list of exactly what goes in each pannier. In Copenhagen, I was able to lay out all the panniers and stuff very quickly using the list. Here is what my list looked liked. I made one front pannier my “purse” which always had my wallet, passport and lunch etc in it. My rain gear was always packed in the same back pannier in close each reach if I needed it quickly. There are items that could have been left at home, but I think I packed pretty lightly. Until next time…….. 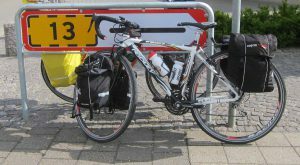 This entry was posted in Packing and tagged Cycle touring, Denmark, packing. Bookmark the permalink.